We are all familiar with yogurt parfaits, right? It’s that healthy breakfast/dessert consisting of layers of yogurt, fruits, granola, and a drizzle of honey. Let’s take all that yummy goodness and put it into a popsicle mold. The result is something sort of epic. My kids are some serious sweet tooth people. Feeding them these yogurt parfait popsicles makes me feel like I’m satisfying their sweet tooth and also doing my part as a mom which is getting my kids to eat healthy. 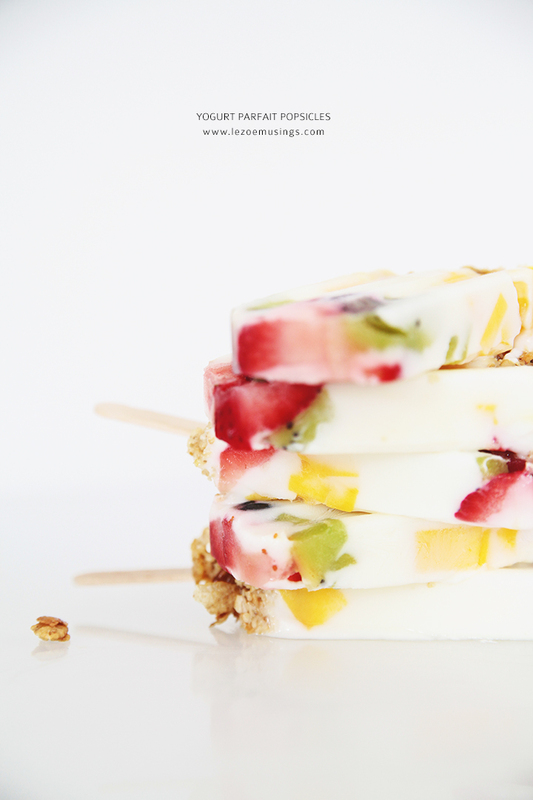 Making these healthy yogurt parfait popsicles is pretty easy. Simply layer the popsicle molds with vanilla yogurt (I used Dannon Oikos greek yogurt), your fruits of choice, granola, and top off with a drizzle of honey. Although the honey will help the granola adhere and freeze better; it’s a bit sticky and will make it a bit hard to remove the popsicles from the molds. Running the molds under warm water and a bit of wiggling action will do the trick! You may also enjoy this delish but beautiful DIY Cherry Rose Tea popsicles as seen HERE. For my full Instagram feed, please see HERE. Your photos look amazing! I love how the colors pop against the white background. The popsicles look yummy. I think I will go make these right now since I have all of the ingredients on hand. It’s going to be a hot day today so this will make the perfect afternoon snack when the kids come home from school. Thank you for sharing! Kids in the family are going to love these….me,too! This is probably one fo the healthiest desserts I’ve ever come across! Can’t wait to try this myself! 🙂 Thanks for sharing this! Where do I find the type of molds you use. I like the looks of them much better than the ones that I am finding! Wow, I think I’m totally gonna try that!! Loved the parfait popsicle idea. So beautiful. I am going to host a kids’ paint-in at my gallery next week and plan to make these for treats afterwards. Thanks for the idea. Amazing pictures! haven’t seen a recipe more beautiful than this! Hey, I’m doing a school project and i would love for you recipe and photos to be featured in it. All credit will go to you and your website will also be featured for others to check out. What a great way to reinvent yogurt parfait! I can’t wait to try it! So trying this! Looks delicious and healthy. Oh wow! I must try this! Looks so yummy!! Looks amazing! I may have to wait at least a few more months to try these babies. These look so gorgeous! Lovely molds. This is such a great, healthy twist to a popsicle 🙂 Great idea! And I love the addition of granola for a little bit of crunchiness. looks delicious n am gonna try this right away! these look incredible!! I’ll have to try them soon. Reblogged this on Lemmyk56's Blog. I’ve been thinking about healthy treats for 3 little boys who will soon be visiting and these will be one. I’ll have one,too. These look awesome!!! Have to try this!! !